During my early days of directing chess clubs throughout the areas after school programs I continuously came across children who sometimes were able to play chess at a reasonable level, knowing how to move the pieces and sometimes even making accurate moves in complicated positions. 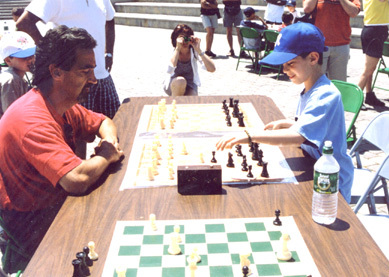 As I would like to take credit for introducing chess to many children in the area, Some children were already playing before ever joining my groups. It was sometimes a relief to me not to have to play touchdown chess, (A drill I have with beginners, where only the pawns are on the board.) but to actually instruct them in a way that would make my hours of study seem worth while. As time went on, I would learn that many childrens chess clubs were not very proficient in advancing the study of chess, concentrating more so in the actual playing of the games. I felt this to be detrimental to the progress and unfair to the children. Then I stumbled across the student who re-assured me that my way of thinking that a child, if interested, has no barriers! It was during a routine after school gathering, with a room full of twenty or so children that I noticed a boy. This first grader, had only joined the group a few times previously, and had played fifteen moves or so into a game with no major problems, however as so many times in a game, without the experience to see a plan, this boy didnt want to make a move. He simply didnt know what to do. Moments later this young boys mother would enter the program room and introduce herself to me. As we spoke, young Curt would sit and anguish what to do, to a point where total frustration would overwhelm him. He began to cry. My experience with children crying was usually after a child would lose, or a parent would have to take them home before their time was up. Children really love to play this game you know. Neither was the case. Curt cried, "I dont know what to do". After a few moments I re-assured Curt that many people, even adults find themselves in these difficult positions. I made a promise that I would help him the next time he came to the chess club. This seemed to help the situation as indicated by his big boyish smile and a high five. I wondered how many children are put in situations where they have no answers, and I prayed I could help one of them. The next time we were to meet I was reminded of my promise. Today I have no regrets. There seemed to be an incredible will to do really good in this game for someone so young. Each time we met there was something else to learn and each time a will to do better. As time would go on I would be informed that Curts dad had taught him of this great game, and that his dad played people all around the world. I told Curt that his dad had experienced the pleasures of this great game and indeed it is a game like no other, that can be played anywhere, anytime, by anyone. Curt with this boyish smile from ear to ear said to me, I want to be as good as my dad." I assured him, as I assure all children, you can be as good as you want to be, in chess and in life, if you believe in yourself and you always try. I told him there is a popular book titled how to beat my dad in chess. Again this great smile occurred. I believe this is where the book bug bit. Curt, out of all my students, not only has his parents buy him chess books, as many children do, Curt actually reads them! After a few more weeks I invited Curt to join my chess academy. It was here that things started to come together. Every lesson giving was not only absorbed, but each and every one continues to be incorporated into each and every chess game Curt plays. Today Curt Beck knows what to do. He has won first place trophies in blitz knockout tournaments, 5 minute speed games, lose and you are knocked out of the tournament. Curt has won his school chess club championship. His collection of accomplishments go on and on. His highest reward, however, is an accomplishment that will last with him a lifetime. Curt Beck has won the New Jersey State Scholastic Chess championship. Today Curt is simple known as "State Champion Curt Beck!" " I dont know what to do!" 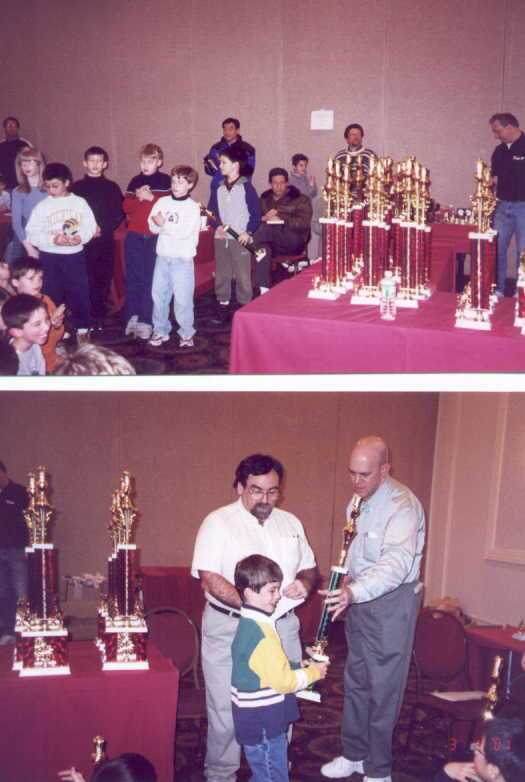 Above, Curt Beck receives his state championship trophy from the tournament director and the president of the New Jersey state chess federation.